ZAMBIA’S chess Women Candidate Master(WCM) Constance Mbatha (right) lost her seventh round game to Zimbabwe’ s Charinda Kudzanayi to slip to second position at Zimbabwe Open 2017 championship. Mbatha, who prior to this round was in command but remained stuck on 5.5 points with a round remaining. The loss gave Kudzanayi an advantage with the Zimbabwean only needing a draw to win the section. 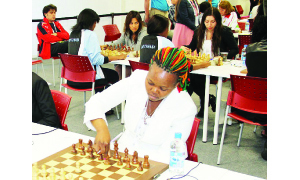 The hosts’ Linda Shaba jumped into the third position on a tie break to Zambia’s WCM Linda Hamoonga, who was occupying the fourth slot with Mushaninga Fungirayiini and Rhoda Masiyazi both of Zimbabwe being ranked fifth and sixth respectively on tie breaker but all on five points. The other Zambians WCM Phyllis Mwilola and Milika Tembo were placed sixth and 21st with four and three points respectively. And both Lusaka Province Chess Association and their Copperbelt counterparts successfully selected 10 players each for the second phase of the trials to be hosted in Mansa this month. In Lusaka, veteran Fide Master Nase Lungu emerged champion after he amassed 5.5 points after seven rounds. And he was followed by eight others who managed five points each and were only separated by superior tie breakers to each other. These are Timothy Kabwe, Robson Kameya, FM Douglas Munenga, Candidate Master (CM) Prince Daniel Mulenga, Judah Simulundu, Linus Katebe, Kela Kaulule Siame and Ellis Chanda in that order. Kondwani Gondwe grabbed the remaining 10th position after managing 4.5points. In Ndola, Kabwe Lwamfwe was a victor with 7.5 points. That is half a point above Michael Kaoma who settled for the second slot. Stephen Mukupa and CM Darlington Nyimbili were tied on 6.5 each and sat third and fourth on the qualifiers. Provincial treasurer Thomas Zulu led other two who did six points in nine rounds. These are Alick Nyirenda and Mwansa Mambwe. Brighton Chiumya and Bornface Ngonga settled for the eighth and ninth position with 5.5 points each while Panji Coma managed to sneak in the team when he got the 10th place with five points to closed the door for the province. The selected players will join national team players in phase two of the trials except nation champions International Master(IM) Andrew Kayonde and Women Fide Master Lorita Mwango on January 12-14.